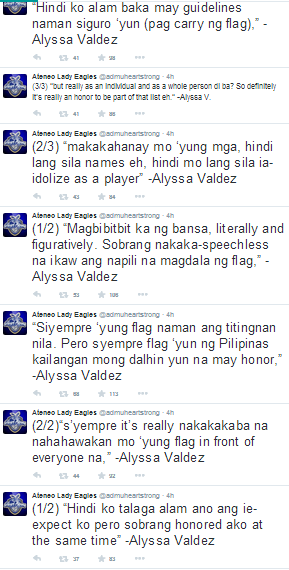 Alyssa Valdez Talks About being The Philippines' Flag-bearer in the SEA Games 2015 Opening Ceremonies: Read it Here! Alyssa Valdez of the UAAP Champions Ateneo Lady Eagles and Shakey's V-League Open Conference 2015 titlist PLDT Volleyball Team will be the flag-bearer of Philippines in the SEA Games 2015 opening ceremony tomorrow (Friday night, 8:00 pm, June 5) in Singapore. 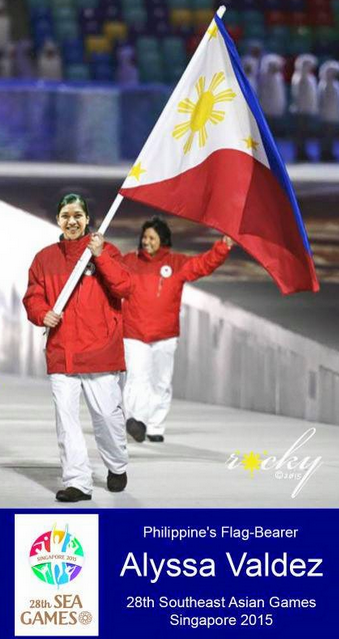 Philippine sports fans will be seeing her lead our country's contingent of athletes in the parade of nations. The Phenom is aware of the importance of her task as the flag-bearer. She even talked about it online. Check her comments below.